What is Control Line Model Flying and what is not? 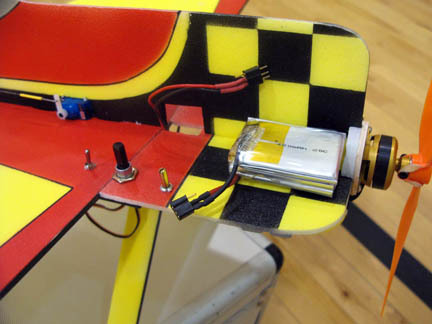 If the pushrod is replaced by a computer and an electric servo this electronic system can "help" the pilot to fly the model. Should this be allowed and if not, how can "automatic flight control" be prohibited? Pat Mackenzie and Kim Doherty fly the world's first true processor based "Fly-by-Wire" control line model airplane. There is no pushrod between the bellcrank and the elevator. 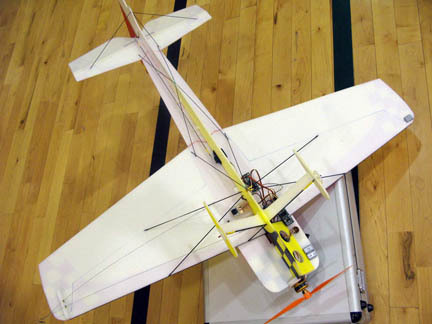 On November 29, 2009 - Pat Mackenzie and I flew a true processor based "Fly-by-Wire" control line model airplane. The model has dynamic throttle control and full fly-by-wire elevator with exponential. In the coming weeks we will activate the rudder and flaps with the same system. This will permit proper rudder usage in the overhead and "RABE" type rudder at other times. We will be able to have exponential on the flaps, differential flaps, exponential on the elevator and be able to mix flaps to elevator as suits the manoeuvre. If you look very closely at the end of the longer video you will see the leadouts moving but not the elevator. I have included two links to YouTube for you viewing pleasure and some pictures of the model. Note that the model would not have to be powered by electric to have the same control system. I would like to thank Pat for the enormous amount of work he put into this project!! It could not have been done without him. This electronic flight control system has started a discussion in the stunt community. The current rules can not stop pilots from using gyros or similar electronic systems to improve the performers of there models. This could completely change the way stunt models are build to day. The focus in F2B would change from the pilot skills to fly his model to the programmer's skills to program the flight computer. Most pilots do not want this change and the F2B Group is working on a proposal to change in the definition of control line model flying. The question of whether to allow or ban (or partially allow) computerised flight assistance/control for c/l models of all classes is undoubtedly instrumental for the future of our common cause. Given the ease of availability of technology and the speed of progress in robotics, I am of the opinion that we must reach soon consenus on how to deal with the fly-by-wire issue in a pro-active way. Furthermore, I do believe the time has come where we must take side and tell the community where we stand. Please find attached an informal draft proposal related to the issue of computerized flight path control for all control line classes. When reading it, please consider its content as being my personal point of view, not necessarily reflecting the opinion of the members of the F2B Working Group. Here Pat adjusts the rpm and exponential on elevator. 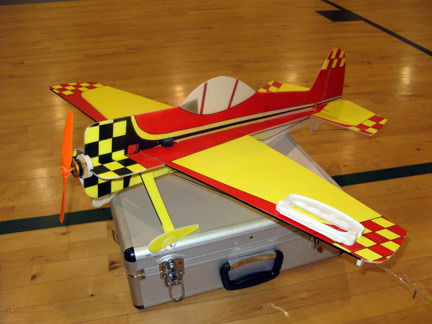 Is a flight during which the model aircraft is permanently attached to two or more wires or cables during the flight. The wires or cables must be attached to a handle being manipulated by the pilot on the ground at the centre of the flight circle. No automatic flight path control, whether done on board of the model airplane or on ground at the handle, is permitted. 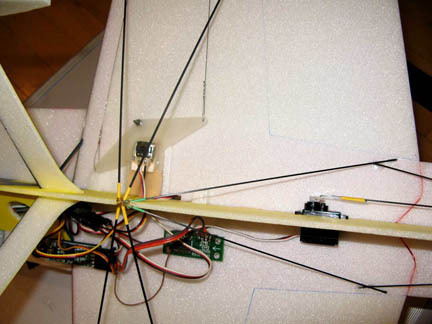 The model aircraft’s flight path may only be controlled by the pilot manipulating the handle and by mechanical signals transferred through the wires or cables. On board of the model aircraft the mechanical signals arriving through the wires or cables must be, directly and mechanically, transferred to flight path controlling elements such as aerodynamic control surfaces/brakes and/or thrust vector control devices. Permitted methods to control and/or operate secondary flight control systems such as, for example, power sources, landing gears and such shall be defined in the specific rules for the individual control line classes. Where such definitions are not given, no control of secondary flight control is permitted. This proposal states that no automatic flight path control should be allowed in line controlled aero modeling. But what is the "flight path" of a CL model? A normal airplane can turn in three directions: Pitch, Roll and Yaw. CL models are flown on lines in a circle around the pilot. The pilot only steers his model "nose up" or "nose down". By controlling the pitch he steers the model to fly the maneuvers or follow patterns on a hemisphere surrounding the pilot. The roll and yaw of the model are limited or blocked by the lines. The flight path of a CL model must be the pattern the model follows on the hemisphere surrounding the pilot. This pattern is only a result of the adjustments to the model's pitch. The scope of this proposal is to ban automatic flight path control but what is "automatic" flight path control? An aero plan can turn in three directions: Pitch, Roll and Yaw. Control line models are flown on lines and the pilot can only control the pitch of the model. The roll and yaw is limited (or blocked) by the lines. Shall the pilot and only the pilot control the pitch of the model? Will no automatic adjustments to the pitch be allowed? The horizontal stabilizer is actually helping to keep the model on a straight forward flying path. The same does the center of gravity when it is placed in front of the aerodynamically center of lift. If the pilot is doing nothing the model will automatically be stabilized to fly in a straight line. If no automatical flight path control will be allowed in the future horizontal stabilizers must be banned and the CG must always be placed at or behind the Lift Center! The yaw of the model is stabilized and adjusted by the vertical stabilizer, the rudder and the positions of the lead-out wires. The roll is also adjusted by the position of the lead-out wire in the inboard wingtip. If a model should hit turbulent air and be given a new direction all these passive components will automatically adjust the roll and yaw and bring the model back to a flight path on the hemisphere. Models with no vertical stabilizer or no connection between the lead-out wires and the inboard wing will give some very interesting challenges to model design in the future. Systems for automatic flight path control should also not be allowed at the handle. The problem is now that the classic handle actually has an active stabilizing effect on the model. If a model is flying upwards and the pilot just keeps the handle in the same (vertical) position the line from the bottom of the handle will be too short and the line from the top of the handle will be to long. The result is that the bellcrank compensates for this new situation by turning a little bit. This gives the model more down elevator and the model will change its flight path. If the pilot do nothing the model will stabilize itself in a horizontal flight. This stabilizing effect is enough to make a model fly without a pilot. An attempt to fly a combat model with an autopilot can be seen in this video clip. Please note how the model is adjusting its flight path up and down right after take off. This is done only by the stabilizing effect from the handle. OK. The spirit of the proposal is to prohibit systems that are doing the pilot's job by automatically steering the model through the maneuvers. We might allow all the passive flight path stabilizers and controlling systems that are common on models today. Only the systems that active help the pilot to fly maneuvers by making adjustments to the models pitch should be banned. At first glance it seems that the roll and yaw is not affected by the problem with automatic flight path control. But some pilots might start to build models with servo driven ailerons and rudder. 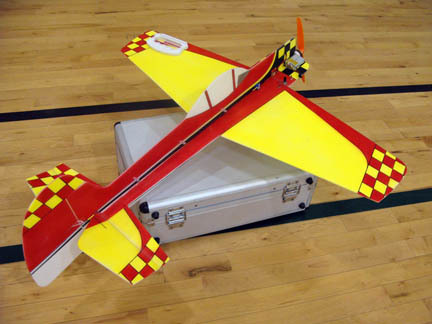 With an onboard computer and a gyro system the model could be programmed to keep the roll stable in turbulent air and to adjust the yaw to optimize the line tension and air flow over the wing. This would not be automatic flight path control (i.e. automatic pitch control). Active roll and yaw control is possible today but it is an open question if these systems shall be allowed in the future. "On board of the model aircraft the mechanical signals arriving through the wires or cables must be, directly and mechanically, transferred to flight path controlling elements such as aerodynamic control surfaces/brakes and/or thrust vector control devices." This clearly prohibits the replacement of the pushrod by a servo system. But there is still an opening for using a servo system to help the pilot fly the model. A servo could be connected to the mechanical control system and actively help the pilot to move the control surfaces. This would not be an automatic flight path control system. The servo system would only help the pilot to do what he wants to do. The servo steering in a car does also not steer the car. It only helps the driver to do what he wants. A CL model could be equipped with a "power steering" and still fulfill the demand of a "direct mechanical connection" in this proposal. A power steering could give the pilot a better control over his model and might help flying the model in just the direction the pilot indicates by his movement of the handle. In strong wind the line tension is sometimes not enough to deflect the control surfaces as much as wanted. This problem could be solved by the help of a servo system. The servo doesn't have to be electric. It could also be made pneumatic or hydraulic and be powered by the engine. On a model with "power steering" it would be easy to change the passive power steering to an active flight path control. Simple by adjusting how much the power steering is helping it would be possible to "optimize" the flight path. If the pilot pulls the up line to make a loop an onboard computer with a gyro could regulate how much the power steering should help deflecting the elevator and flaps. I do not think we need to make any radical changes to the definitions of control line model flying. The automatic flight path control is only a problem in Stunt and can probably be solved by less drastic changes in the rules for F2B. Common for all automatic flight path control systems is that they need to do something to the control system. By prohibiting any systems from acting on the control system the flight path control can only be done by the pilot with the handle. A short version of a simple rule would be: "No power steering"